Slingerland May Bell Style 182 Model Arch Top Mandolin, c. 1936, Chicago. 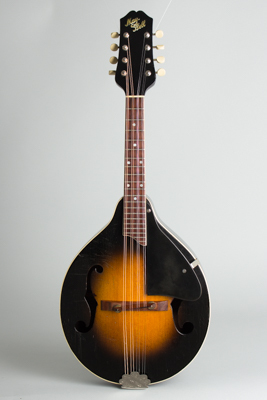 This May Bell Style # 182 was one of two arch-top mandolins offered in the mid/late 1930's Slingerland catalogs, a time when the mandolin was at a low ebb in popularity. This model sold for $17.50-plus $ 3.80 for the chipboard case, which was not a pro-level price but still a decent amount of money at the time. It is quite similar to the Kalamazoo instruments Gibson was making and selling at the time with a pressed, X-braced solid spruce top and solid mahogany back and sides. The fittings are fairly deluxe with decorated tuners and tailpiece and the top sports a nice "Cremona" sunburst top (Slingerland's description). This is a very nice f-hole mandolin for the price in exceptionally fine condition for its age. Overall length is 25 3/4 in. (65.4 cm. ), 10 1/4 in. (26 cm.) across at the widest point, and 2 in. (5.1 cm.) in depth, measured at side of rim. Scale length is 14 in. (356 mm.). Width of nut is 1 1/4 in. (32 mm.). For a 1930's depression-era instrument this mandolin is amazingly clean overall. There is hardly any finish wear, it looks like nobody ever played it very much. The plating on the metal parts looks virtually new. It's not perfect as there is just one small repaired spruce grain crack off the back edge of the bass side F hole-fairly neatly sealed up but visible. There can't be many of these around in this state of preservation-while not a top-line instrument it is a good sounding and playing pre-war F-hole mandolin with a great vibe, still housed in its original chipboard case. Excellent Condition.